I was recently asked by an aspiring young lady for advice, as she strives to reach executive status in her career. The question initially struck me as odd, as it’s not like I can recommend reading a specific book or listening to a self-help podcast. Nonetheless, there are certainly a number of things young women can do to be successful and work toward moving up the corporate ladder. Need I state the obvious? Work hard. Do you need to put in more than eight hours a day? Maybe. But working long hours isn’t necessarily the key to being promoted. On the other hand, being a clock-watcher will certainly get noticed — just not in a good way. Volunteer for extra responsibilities. Do your research when working on a project, investing the necessary time to produce a quality result. Do something you love. It is a lot easier to work hard when you love what you do. We invest far too many hours in the workplace to be involved in a career or a role that we do not find rewarding. If you don’t love it, do some soul searching and put yourself on the right path. Your job doesn’t have to be perfect, but finding the overall feeling rewarding and enjoyable will allow you to achieve greater success, and more importantly, overall happiness. Use your voice. There is a balance between being too vocal and being a fly on the wall. If you wish to move up the corporate ladder, you need to be heard. During meetings, be engaged. Don’t just listen and pay attention; more importantly, contribute. Share your ideas. Know the topic so that you can give intelligent input, not talk just to hear yourself speak. Volunteer to perform the necessary research for the task at hand. Have an opinion derived from intellectual thought and share it. Surround yourself with people who support you. Hopefully you work in an environment where people believe in you and are encouraging your growth. If you don’t, it may be time to re-evaluate your path. Remain positive. Looking through a lens of positivity is a lot healthier than constantly seeing the glass half-empty. While you may have an outlet at home for venting about work issues, most of your time at home, and definitely at work, should be spent spreading good news. Negativity breeds negativity and it can consume your thoughts, your actions, and your physical-being. There is no room for “woe is me” in the executive wing. Focus on your blessings, the successes you’ve achieved, the things that went right. Make sure the majority of your mental energy is spreading good news, not your worries or your complaints. Avoid negative people. The biggest part of remaining positive is who you surround yourself with. Both at home and at work, remove yourself from negative environments. Some people choose to be negative. Everything they do includes complaining, blaming others, feeling persecuted — it’s a miracle they’ve lived past their teenage years. While these people may be humorous, or you may believe you can “fix” them, ultimately they drain your energy and can cause you to see things through their same jaded glasses. Learn how to cut those conversations short. Don’t contribute to negative discussions, and certainly do not bad-mouth others in the workplace. The grapevine is alive and well and you do not want your name attached to anything that can negatively impact your reputation. Envision what you want. Allow that to be your driving force. Believe it and make it happen. While this may be a picture of yourself in a role, try to focus on certain behaviors or attributes you believe are important for you to have in order to attain the role. For example, if you’re working on your confidence, envision yourself as the confident individual you want to be. If you wish you were more positive, see yourself as spreading positivity through the workplace. Wake up every day and write it down. Spend time contemplating the words as you compose them. This five-minute daily exercise can set your mood for the day. It will inspire you into positive action. Be aware that you are always making an impression. Remember that and keep that in focus (this is a great parenting tactic too). The relationships you build today, while they may seem small, can lead to incredibly significant results; often unknowingly. The actions, and reactions, you provide is ultimately crucial to opportunities in the future. Be confident. Present yourself confidently and capitalize on your strengths. There is a balance between confidence and over-confidence. Finding it is important. Presenting yourself with poise and knowledge helps ensure others see self-assurance but not self-righteousness. If you believe in yourself, others will too. The more confidence you exude, the more confidently you are viewed. Foster collaboration. Recognize that, while you may be confident, others have a voice. Encourage others to speak and be respectful of ideas. People want to be part of an organization in which they themselves are valued. While you may be working on your own career path, be cognizant that others are doing the same. As such, encouraging the exchange of ideas, respecting contributions by others, giving credit to people within the workplace helps create an organization built on respect. Get to know everyone. 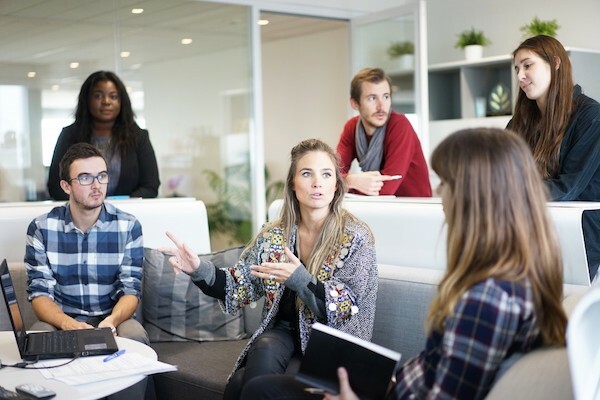 Whether your workplace has 10 employees or 10,000 employees, staff members at all levels are contributing to the success and growth of the organization. Recognizing employees’ individual strengths and/or circumstances, helps create an environment built on respect. While an entry-level employee may not be responsible for the next biggest negotiated contract, she may be a factor in your company’s next five-star Yelp review. Everyone has a contribution to the organization. Celebrating individuals by simply getting to know them will help others to promote you, both vocally and emotionally. Follow-through. Remember what you have committed to doing, and follow through. Ensure others in the organization know they can rely on you. Whether you promise a frontline employee you will get someone to look into their slow computer, or you commit to calling a colleague for a reference, make sure you do as you say. Follow-through can also be taken to the next level; simply remembering an earlier conversation with a coworker. Asking about the vacation they mentioned, or their spouse’s surgery; these small gestures reflect your human-side and allows staff to see you with more depth. There isn’t a formula for rising on a career path. Nonetheless, it is within your control. Focusing on what you can do versus your obstacles will ultimately put you in the driver’s seat and provide you with self-satisfaction and overall happiness. Remember your more natural traits as a female. Are you compassionate? Sensitive? Intuitive? Build on your strengths. Don’t try to hide them or be something you’re not. Be the best version of you. —Anne McClure is the chief executive officer for Cabrillo Credit Union. P.S. But if none of this works, just feint loyalty while stabbing people in the back.